Solar PV & wind are on track to replace all coal, oil, and gas within two decades. 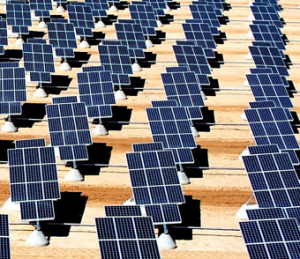 Solar photovoltaics are now the world’s leading source of new electricity generation. US Air Force. Solar photovoltaic and wind power are rapidly becoming cheaper and more abundant than ever – so much so that they are on track to supplant fossil fuels worldwide entirely within two decades, with the time frame depending mostly on politics. The protestation from some politicians that we need to build new coal stations sounds rather quaint. The reality is that the rising tide of solar photovoltaics (PV) and wind energy offer our only realistic chance of avoiding dangerous climate change. No other greenhouse solution comes close, and it is very hard to envision any timely response to climate change that does not involve PV and wind doing most of the heavy lifting. Solar PV meets all of these criteria, while wind energy also meets many of them, although wind is not as globally ubiquitous as sunshine. We will have sunshine and wind for billions of years to come. It is very hard to imagine humanity going to war over sunlight. Most of the world’s population lives at low latitudes (less than 35°), where sunlight is abundant and varies little between seasons. Wind energy is also widely available, particularly at higher latitudes. PV and wind have minimal environmental impacts and water requirements. The raw materials for PV – silicon, oxygen, hydrogen, carbon, aluminium, glass, steel and small amounts of other materials – are effectively in unlimited supply. Wind energy is an important complement to PV because it often produces at different times and places, allowing a smoother combined energy output. In terms of worldwide annual electricity production wind is still ahead of PV but is growing more slowly. The wind energy resource is much smaller than the solar resource, and so PV will likely dominate in the end. Complete replacement of all fossil fuels requires solar and wind collectors covering much less than 1% of the world’s land surface area. A large proportion of the collectors are installed on rooftops and in remote and arid regions, thus minimising competition with food production and ecosystems. The more widely PV and wind generation are distributed across the world, the less the risk of wide-scale disruption from natural disasters, war and terrorism. Other clean energy technologies can realistically play only a minor supporting role. The solar thermal industry is hundreds of times smaller than the fast-growing PV industry (because of higher costs). Hydro power, geothermal, wave and tidal energy are only significant prospects in particular regions. Biomass energy is inefficient and its requirement for soil, water and fertiliser put it in conflict with food production and ecosystems. Nuclear is too expensive, and its construction rates are too slow to catch PV and wind. PV and wind are often described as “intermittent” energy sources. But stabilising the grid is relatively straightforward, with the help of storage and high-voltage interconnectors to smooth out local weather effects. By far the leading storage technologies are pumped hydro and batteries, with a combined market share of 97%. The cost of PV and wind power has been declining rapidly for many decades and is now in the range A$55-70 per megawatt-hour in Australia. This is cheaper than electricity from new-build coal and gas units. There are many reports of PV electricity being produced from very large-scale plants for A$30-50 per MWh. Solar PV and wind have been growing exponentially for decades and have now reached economic lift-off. In 2018, PV and wind will comprise 60% of net new electricity generation capacity worldwide. Coal, gas, nuclear, hydro and other renewable capacity comprise the rest. Globally, US$161 billion will be invested in solar generation alone this year, compared with US$103 billion in new coal and gas combined. PV and wind are growing at such a rate that the overall installed generation capacity of PV and wind has reached half that of coal, and will pass coal in the mid-2020s, judging by their respective trends. In Australia, PV and wind comprise most new generation capacity. About 4.5 gigawatts of PV and wind is expected to be installed in 2018 compared with peak demand of 35GW in the National Electricity Market. At this rate, Australia would reach 70% renewable electricity by 2030. Together, PV and wind currently produce about 7% of the world’s electricity. Worldwide over the past five years, PV capacity has grown by 28% per year, and wind by 13% per year. Remarkably, because of the slow or nonexistent growth rates of coal and gas, current trends put the world on track to reach 100% renewable electricity by 2032. Deep cuts (80% reduction) in greenhouse gas emissions require that fossil fuels are pushed out of all sectors of the economy. The path to achieve this is by electrification of all energy services. Straightforward and cost-effective initial steps are: to hit 100% renewable electricity; to convert most land transport to electric vehicles; and to use renewable electricity to push gas out of low-temperature water and space heating. These trends are already well established, and the outlook for the oil and gas industries is correspondingly poor. Read more. What’s the net cost of using renewables to hit Australia’s climate target? Nothing. The best available prices for PV already match the current wholesale price of gas in Australia (A$9 per gigajoule, equivalent to A$32 per MWh for heat). High-temperature heat, industrial processes, aviation and shipping fuel and fugitive emissions can be displaced by renewable electricity and electrically produced synthetic fuels, plastics and other hydrocarbons. There may be a modest additional cost depending on the future price trajectory of PV and wind. Electrifying the whole energy sector of our economy of course means that electricity production needs to increase massively – roughly tripling over the next 20 years. Continued rapid growth of PV (and wind) will minimise dangerous climate change with minimal economic disruption. Many policy instruments are available to hasten their deployment. Governments should get behind PV and wind as the last best chance to deliver the necessary solution to global warming. Andrew Blakers Professor of Engineering Australian National University, and Matthew Stocks Research Fellow ANU College of Engineering and Computer Science Australian National University.